Make lots of original videos and upload them to YouTube in just one click. Supports spintax to create unique titles, descriptions and tags. Supports shortcode to target keywords for all cities in U.S & Indonesia. You can also add your own shortcode database. Last chanceMany people regret not buying TGP v1 when launched last year. Don't let that happen again to you! Secure the discount coupon immediately! why do you have to make lots of videos ?? Many online marketers have taken advantage of the awesomeness of YouTube as their promotional channel. But unfortunately they are still doing manuals. This is where the Tube Generator Pro comes in to ease your business. If you previously needed 3 employees to upload 90 YouTube videos every day, now you can do it yourself while lying down with more results !! imagine how much you can save !? 3 Employees Just To Upload Video? You might be confused why they are willing to pay 3 employees just to upload YouTube videos every day, right!? Ok ... let us explain so you can get the clue. Type on google "post generator pro" and see no 4. That's right, YOUTUBE video!! 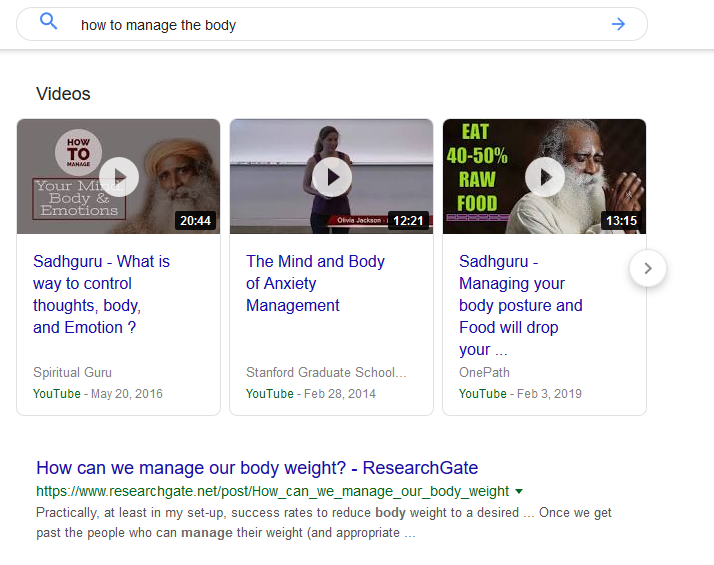 Type "how to manage the body", check on the top of the page. Again, YOUTUBE video!! Type "fidget spinner", see no 3 & 4. YOUTUBE again!! 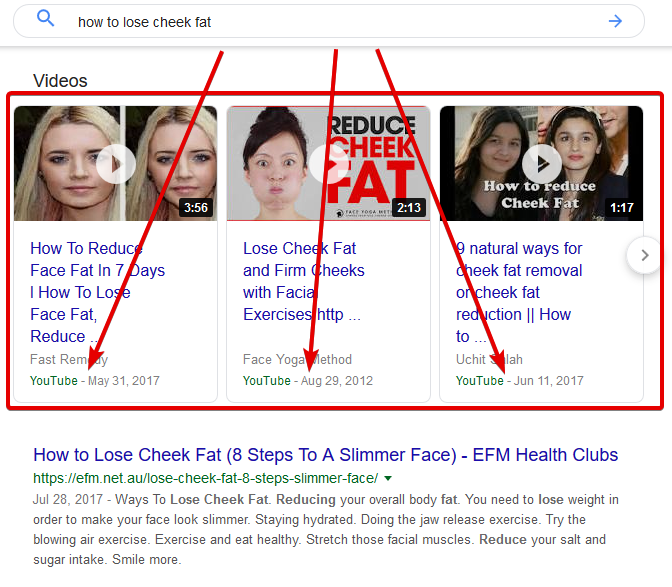 Type "how to lose cheek fat", see on the top of the page. YOUTUBE and Youtube again?! 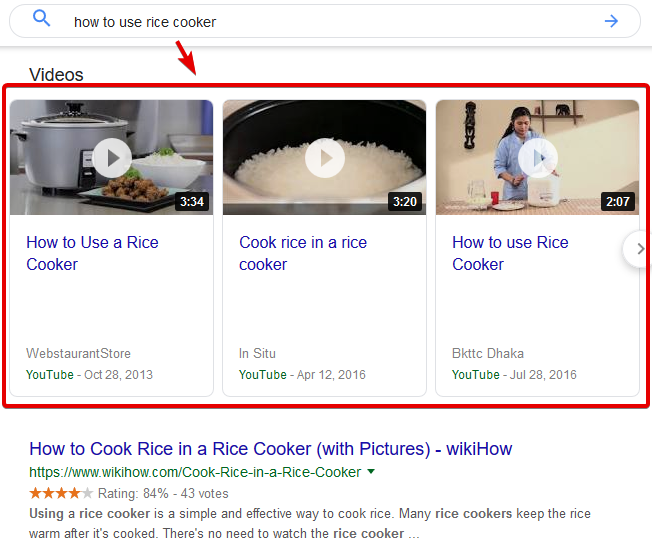 Type "how to use rice cooker". See your self. Oopss.. YOUTUBE again!! 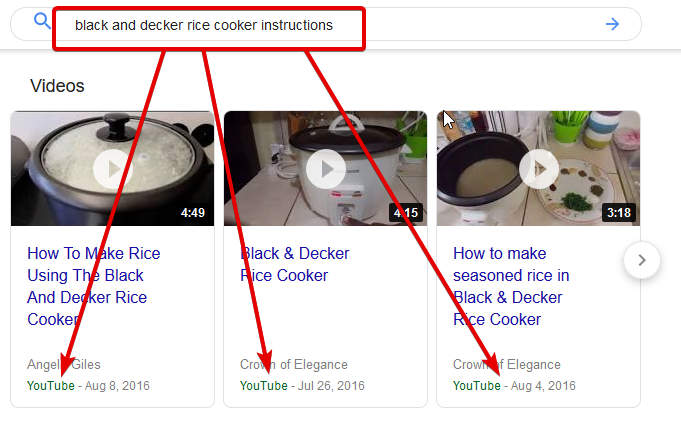 Type "black and decker rice cooker instructions". Specchless? 😀 YOUTUBE, YOUTUBE, YOUTUBE!!! ALREADY HAD THE CLUE ?? That's right, Google gives a special portion for youtube videos to appear on the first page! This means that we can use YouTube to bring up our keyword on to page 1 google !! Ok, got the idea, right? NOT YET!!! THERE ARE SOMETHING MORE THAN THAT! Of course you already know or hear the malignancy of Post Generator Pro to destroy page 1 google with the concept of local search (LBO/Local Business Optimation) and abandoned keyword (long tail keyword). There were those who worked alone until they had 6 employees because of Post Generator Pro, some of them got tens of millions of projects, some of them got thousands of orders via website every day. All make use of the Post Generator Pro. No need hosting and domain anymore! Well ... What if the features in PGP are applied in the Tube Generator Pro ?? What if the local search concept (LBO) and abandoned keyword from PGP are applied in the Tube Generator Pro ?? Correctly!!! You will get better results from Post Generator Pro. And even more awesome, you don't even need a hosting and website anymore. Everything has been served by YouTube! Just run TGP and you are done! Make hundreds of videos, write descriptions, tags, upload them to the youtube manual one by one is so tired! Especially having to do it every day, boring! Recruit employees? spend a lot of money! Let Tube Gengerator Pro work for you. This advance features of Tube Generator Pro wrapped in a simple user friendly user interface will help bolster your business potential. To make hundreds of unique videos is quite easy. Just click the generate button and hundreds of videos will be created by Tube Generator Pro. Tube Generator Pro will upload all of your videos and write titles, descriptions, and tags automatically. All you need is to click the "start" button, that's all. Tube Generator Pro also supports nested spintax so to write the title, description & tags of each video, just write it once. Mainstay features of Post Generator Pro to optimize the local search concept (LBO / Local Business Optimization) are also embedded in the Tube Generator Pro. With this feature you can target all cities in U.S or any other country with just one write. You can also add your own city database or shortcode. With the chrome profile control you can import chrome profiles that you usualy use. Tube Generator Pro uses a chrome browser. The upload process to YouTube is exactly the same when you upload videos to YouTube. Open the browser to type the address, write the title, description, and tags as you normally do so that it looks more natural. Currently Tube Generator Pro is available in 2 languages; Indonesian, and English. You can use Tube Generator Pro in any account and youtube channel that you have. Every video that has been uploaded will be included in the blacklist. So it won't be uploaded 2x even though you forgot to upload the same video again. Tube Generator Pro has the ability to select backsounds on randomly generated videos. So that backsounds between one video and another video the can be different. This will increase the level of uniqueness of the video produced. Just like Bulk upload, the difference is in this menu the videos will be uploaded one by one alternately. After the video 1st has been successfully uploaded, the TGP will automatically upload video 2nd, and so on. "Previously, I used Imacros to automatic upload to YouTube with up to 9 videos uploaded. now using tgp I can get 16 videos uploaded." "TGP is cool. until now there has been no suspended youtube channel." Try Tube Generator Pro trial version today! Before you decide to buy full version, you can try it first the tiral version for free. Price is for purchasing 1 license. Make sure you read this FAQ before buying! What is the Tube Generator Pro software? Tube Generator Pro is desktop software that runs on a Windows operating system. Recommended minimum 4GB RAM. Is it safe for our YouTube account? Tube Generator Pro is designed as much as possible so that our youtube account is safe. But the possibility of a YouTube account being suspended or penalty remains. Use wisely. We are not responsible if your YouTube account is suspended and so on. Sure. You can move to any account or other channel that you have without being limited. What is the licensing system for this Tube Generator Pro? 1 TGP license can only be installed on 1 computer / laptop. You are allowed to move to another computer for a maximum of 1x in 2 weeks. 1 license is valid for 1/3/6 months depending on your purchase package. 1 license can be used for unlimited YouTube accounts & channels that you have. TGP can only be run on a Windows operating system. With the system requirements as below. Latest version of chrome installed. You might be able to run it on Linux or Mac OS on top of Windows emulators such as wine etc. But we have never tried this. There is no guarantee if you run it on a non-Windows OS. What is the maximum video that can be uploaded? From Tube Generator Pro itself does not limit how many videos you can upload. Our recommendations in one upload are no more than 20 videos, and 100 videos in 1 day. Be careful, too many video uploads can cause your YouTube account to be detected as spam. The risk is that accounts are suspended. What is the size of the image file? The most optimal size is 1280 x 720px, but you can use other sizes. Tube Generator Pro will automatically adjust / resize your image. What files can be processed into videos by TGP? What files can be uploaded by TGP? Can I upload videos that are not generated by TGP? Sure, as far as it has .mp4 extension TGP can upload it. Is it permissible to resell licenses or make it a bonus for purchasing other products? You are welcome. Besides being able to become an affiliate partner to get sales commissions you can also sell TGP licenses or make it a bonus for purchasing products from other vendors. Your client simply registers as a free member. Then the license uses your license. Please note, support is only given to you as a license buyer. Your client does not get support from us. Of course. Support is carried out using a ticketing system. If there are problems you can ask for help from the team by send them an email to support@pakarbot.com our team will get in touch with you as fast as we can. Is there any Facebook/WA group? Yes we have facebook group. The Facebook group is a forum for discussion with fellow members. Not a group to support.